One of the things that can kill you, your dreams, your marriage and your relationships with others is your thought life. If you are thinking negative thoughts, constantly worry about the what ifs, talk yourself out of doing something positive, you have what my pastor calls “stinking thinking.” Stinking thinking can cause a lot of damage, prevent us from reaching our day to day goals and dreams. So let’s talk about your thought life. 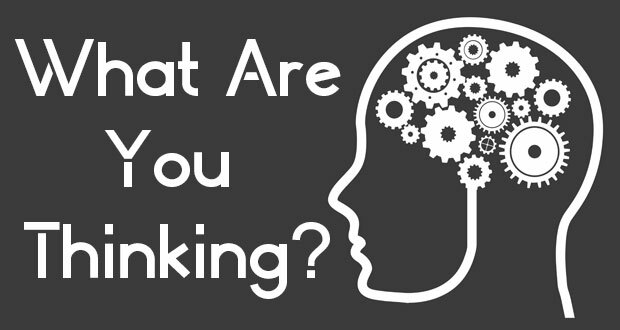 What are you thinking? I have to admit, one of my most consistent struggles is with my thought life. Negative thoughts, what ifs and fearful thoughts constantly come my way but by the grace of God, they don’t stay. If you are not careful the thoughts will hit you as soon as you wake up. The thoughts can be so powerful that they will stop you from doing what you know is the right thing to do. For example, you want to get up and exercise but instead you lay in the bed thinking all kinds of thoughts for an hour and before you know it, your thoughts have killed your time (needless to say, you don’t get the exercise in). You started with a good thought (to exercise) but then negative thoughts came in to tell you 5 reasons why you shouldn’t or you can’t exercise. Does anyone out there know what I am talking about? If you are not careful, stinking thinking can affect your marriage or other relationships because the enemy wants to kill, steal and destroy. He wants to get you so focused on something negative that someone did or said until it consumes your thought life. When you think on negative thoughts for any length of time, it will often produce negative behavior. Since this is a consistent battle that I have to fight. I just want to share my strategy: First I want to give you a prescription for negative thoughts and stinking thinking. Philippians 4:8-9 says: “Finally, brethren, whatever things are true, whatever things are noble, whatever things are just, whatever things are pure, whatever things are lovely, whatever things are of good report, if there is any virtue and if there is anything praiseworthy mediate on these things. The things which you learned and received and heard and saw in me, these do, and the God of peace will be with you. ” We have to replace negative thoughts and stinking thinking with good thoughts. Second: As soon as a negative thought comes to your mind you have to immediately cast it out. II Corinthians 10:4-5 says: “For the weapons of our warfare are not carnal but mighty in God for pulling down strongholds, casting down arguments and every high thing that exalts itself against the knowledge of God, bringing every thought into captivity to the obedience of Christ. ” If what you are thinking does not line up with the Word you must take that thought and submit it to Christ. Now I wish that I could tell you that once you take this prescription you will never have negative thoughts again. This is a daily battle and we must fight it with a daily diet of the Word of God especially first thing in the morning. God has great things in store for us but we must allow Him to be in control of our thoughts. I encourage you to think good things!